• World catching on to truth about Israeli genocide despite meticulous crafting of message by Zionists. The Zionist power elite are masters of the Big Lie. They have convinced the credulous of this world that unbridled destruction is a “targeted attack” and that the massacre of thousands of mostly unarmed Palestinian children, women and men is “self-defense.” Were Syria, Iran—or even France—to attempt such a thing, international outrage and intervention would be a foregone conclusion. But terrorist, genocidal Israel gets a free pass. Why? Because it controls and directs the language describing its atrocities. In the face of multiplying Israeli crimes against humanity, however, the truth may finally be getting the upper hand. As of August 3, the month-long murder rampage by the Israeli military in Gaza, “Operation Protective Edge,” has claimed more than 1,830 lives of besieged Palestinians—three-quarters were civilians, said the United Nations—and left nearly 10,000 injured, tens of thousands homeless, thousands out of work and hundreds more imprisoned. The death toll is now over 2,000. The point of the manual is not to convey truth; it is to assist in achieving nearly blind, emotion-based support for Israel from Americans and Europeans. The author, Dr. Frank Luntz, encourages Jews to repeat even falsehoods if they serve the Israeli war against Palestinians, Iranians and others. A few illustrations prove the point. The Zionist dictionary-inspired narrative claims that Israel wants peace with its neighbors, possesses the “most moral military in the world” and deplores and limits civilian casualties. Israel is ostensibly a “democratic” and peace-loving country, America’s “best friend” in the region—the last defense hindering inhuman, barbaric Arab terrorists and death in American streets. Tiny Israel can only defend itself against overwhelming enemies with billions of United States dollars. Israelis are prepared to make peace “today” with “reasonable” Palestinians—if it can find any. Meanwhile, a modest “security fence” and targeted defense raids on “terrorists” protect the Israeli people. It is all “for the children” on both sides. The truth, as we often report, is far uglier. Israel is a Jewish, apartheid, racist state that persecutes Arabs, Sephardic Jews and frequently non-Jewish foreigners. It has a long history of subverting U.S. interests, examples being the USS Liberty attack, the Jewish Defense League, the American Israel Public Affairs Committee and Israeli spy Jonathan Pollard. “Peace” to the Israeli government means “the absence of Arabs.” A “reasonable” Palestinian capitulates to Israeli demands. Miles of prison walls and machine gun turrets isolate Palestinians from the world, from family, from work, from hope. Israelis steal Palestinian lands and attack Palestinian families, homes, farms, factories, schools, hospitals, churches, mosques and refugee shelters while they are inhabited. Israelis poison wells and destroy crops. The Israel Defense Force deliberately targets Palestinian women and children because they pose a demographic “existential threat” to Israel. To Netanyahu and his thugs, all Palestinians appear as “terrorists,” because they make a token defense of their homes. This time, however, a backlash against Israeli terrorism is building—more overseas than in the U.S. Tens of thousands of concerned people worldwide have demonstrated against Israeli atrocities, and the mainstream media has even reported it. Growing numbers of prominent Jewish voices, like those of Noam Chomsky and journalist Max Blumenthal, are speaking out for Palestinians. Israel’s anti-Zionist group Jews Against Genocide, indicts Israeli war crimes more eloquently than we could. While the Zionist-controlled media still claim the vast majority of Americans “support” Israel, the truth appears otherwise. A recent Google Consumer Survey showed that nearly 60% of Americans polled did not have much accurate information about Israeli military actions against Palestinians. The remaining 40% split their opinions in half. Try to learn that from the lapdog presstitutes. Even in Israel, growing disgust and outrage over the government’s anti-Palestinian violence, and elsewhere a burgeoning Boycott Divestment Sanctions movement against Israeli apartheid, have forced officials to propagandize their own people. Former Knesset member Efraim Sneh compared the “brainwashing” of Israelis to the work of Nazi Joseph Goebbels. A number of Israel Defense Force reservists courageously have refused to fight against Palestinians. For the first time, Senate Republicans have blocked emergency military aid to Israel. These are hopeful signs that must motivate us to keep up the pressure for peace in Palestine. 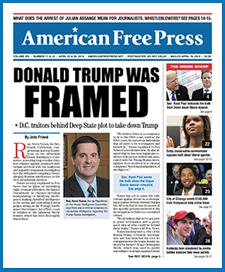 Trust AMERICAN FREE PRESS to report the truth. Do your part and contact Congress and the Israeli embassy today. Tell them to stop annihilating the Palestinians. Just put it this way. Everything thst comes out of a jew’s mouth is a LIE! 4 years of concentration camps in Nazi Germany means ZERO against 40 years in the real Aske-Nazi Auschwitz, also known as Gaza Strip!!! The holyhoaxers feed us 70 years with lies and paranoia stories but can never suppress the truth about the Palestinian holocaust committed by the “Ash” claiming to be but the only most li-ke-ly Nazis in this world and millennia!!! Here I watch Al Jazeera and RT News!! !